The newest installment of Alexander McCall Smith's perennially popular and irresistibly charming 44 Scotland Street series. Bertie's respite from his overbearing mother, Irene, is over. She has returned home from the Middle East, only to discover that her son has been exposed to the worst of evils: cartoons, movies, and even carbonated beverages. But the one who should be most concerned is her unfortunate husband, Stuart, upon whom her wrath is about to descend. Meanwhile, Bruce has fallen in love with someone other than himself; Big Lou wants to adopt her beloved Finlay; Matthew and Elspeth host the Duke of Johannesburg for supper; and Bertie decides he wants to move away from Scotland Street altogether and live with his grandmother, Nicola. Will Irene and Stuart's marriage survive? Will Bruce's newfound love last? And can Bertie really be leaving home? 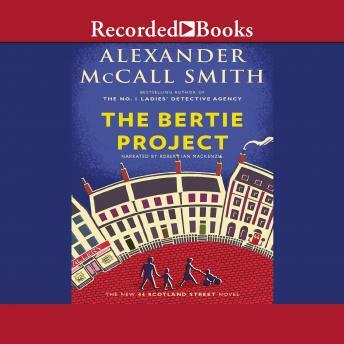 With wit, warmth, and humor, Alexander McCall Smith explores these matters of the heart and more with the colorful cast of characters from 44 Scotland Street.